GeoDistanceSlider creates a location search based range slider UI component that is connected to a database field. It is used for distance based filtering. finding restaurants in walking distance from your location. discovering things to do near a landmark. an object with start and end keys and corresponding numeric values denoting the minimum and maximum possible slider values. an object with start and end keys and corresponding String labels to show labels near the ends of the GeoDistanceSlider component. pre-select the search query with location option and distance with distance option. set the placeholder to show in the location search box, useful when no option is defaultSelected. showIcon Boolean [optional] whether to display a search or custom icon in the input box. Defaults to true. iconPosition String [optional] sets the position of the search icon. Can be left or right. Defaults to right. when enabled, preset the user’s current location in the location search box. Defaults to true. enable creating a URL query string parameter based on the selected location from the slider. This is useful for sharing URLs with the component state. Defaults to false. countries String Array [optional] restricts predictions to specified country (ISO 3166-1 Alpha-2 country code, case insensitive). For example, ‘us’, ‘in’, or ‘au’. You can provide an array of up to five country code strings. trigger the tooltip according to the value specified. Can be hover, focus, always and none. Defaults to none. See the Pen GeoDistanceSlider Example by Dhruvdutt Jadhav (@dhruvdutt) on CodePen. connect with external interfaces using beforeValueChange, onValueChange and onQueryChange. specify how options should be filtered or updated using react prop. 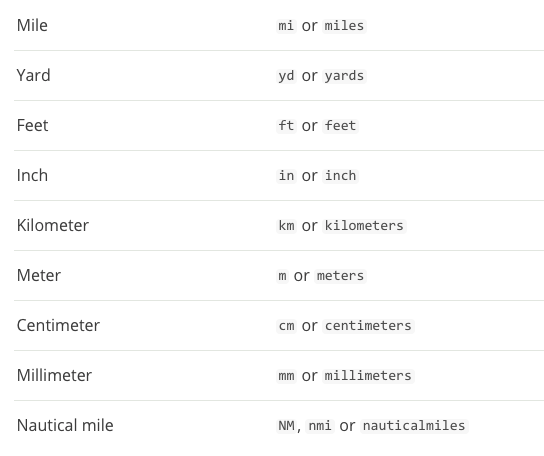 CSS styles to be applied to the GeoDistanceSlider component. takes location, distance and props as parameters and returns the data query to be applied to the component, as defined in Elasticsearch Query DSL. Note: customQuery is called on value changes in the GeoDistanceSlider component as long as the component is a part of react dependency of at least one other component. is a callback function which accepts component’s future value as a parameter and returns a promise. It is called every time before a component’s value changes. The promise, if and when resolved, triggers the execution of the component’s query and if rejected, kills the query execution. This method can act as a gatekeeper for query execution, since it only executes the query after the provided promise has been resolved. is a callback function which accepts component’s current value as a parameter. It is called every time the component’s value changes. This prop is handy in cases where you want to generate a side-effect on value selection. For example: You want to show a pop-up modal with the valid discount coupon code when a user searches within a specific location area. specify dependent components to reactively update GeoDistanceSlider’s options. Read more about it here. one of and, or, not defines the combining clause. and clause implies that the results will be filtered by matches from all of the associated component states. or clause implies that the results will be filtered by matches from at least one of the associated component states. not clause implies that the results will be filtered by an inverse match of the associated component states. String is used for specifying a single component by its componentId. Array is used for specifying multiple components by their componentId. Object is used for nesting other key clauses.